Lots of intentional communities are connected with the WWOOFing network (World Wide Opportunities on Organic Farms). It’s a great way for volunteers to gain experience living and working on an organic farm in exchange for room and board. 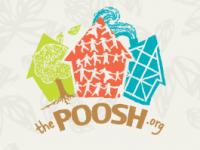 But have you heard of the POOSH network, which connects people interested in natural and sustainable building projects? Short for the People’s Organization on Sustainable Housing, it matches POOSHers (volunteers) with build project hosts. Volunteers help build a sustainable project with natural or recycled materials, and may receive food, a place to stay, and education in return. It’s essentially a Village Building Convergence on a global scale. Volunteers can camp out on the property and will be provided food and rustic shelters. They’re looking for people who have experience working with cob, or at least want to get their hands dirty and “learn by doing”. 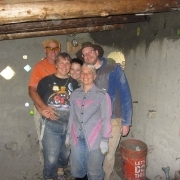 Other projects include Earthships, rammed-earth dwellings, passive houses, hobbit holes, and more. According to the website, “ThePOOSH.org encourages its members to research a wide variety of building materials.” These might include renewable resources like bamboo, clay, and straw, or reusable trash like rubber tires and aluminum or glass containers. Want to get more involved with natural building? You can look for a project close to home, or make plans for an overseas adventure in Europe or Asia. Visit thePOOSH.org to sign up as a volunteer or to list your own project!